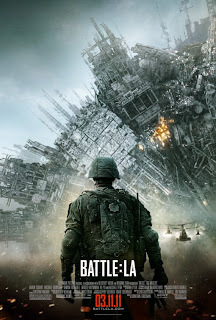 Battle Los Angeles is one of those sci-fi movies I would have liked to see on a big screen when it was released but didn't really inspire me to make sure I did. Plus it stars Aaron Eckhart, who irritates me for some reason in most movies. I don't know why? I wasn't his biggest fan in The Dark Knight. He's actually a very good actor in the right film and Battle Los Angeles definitely agrees with him. At least I wasn't irritated by him when I caught the movie on free to air TV tonight. Being a long time sci-fi fan what caught my eye about this film is that it's an alien invasion movie. Sure you've probably seen it all before but the design of the aliens and their spacecraft seemed fairly unique to anything I'd seen before. In that department it didn't disappoint. Although the actual aliens reminded me a lot of those from the Alien Movies their armor, space craft and other tech was all pretty impressive. The movies plot is fairly straight forward. A unit of soldiers are pitted against the entire alien force (well the Los Angeles chapter at least) and must work out how to save the planet. Along the way the troops learn a thing or two about trust and loyalty, whilst the staff sergeant (Eckhart) earns redemption from his tragic past. This movie's biggest strength is also something of a weakness. It deals with the whole situation in a very realistic way that makes the film seem like a typical war movie where the enemy just happens to be aliens. You never see the battle from the alien's point of view or learn anything about them that the soldiers don't learn for themselves. It's pretty fast paced with lots of shaky cam that must have made cinema goers a little bit nauseous. I did appreciate all the realism and fast pace but it comes at the expense of never really getting to know any of the characters very well. You get glimpses here and there into each soldiers life but it's not enough to get you to care about them. It's not really a spoiler to tell you that some of the troops don't make it in a war film. The thing is I never cared about those that didn't make it. In fact I wasn't even sure who it was that died in some scenes. If the script had managed to get me to care about every soldier in the unit, in the same way that Eckhart's character did, it could have been a great movie instead of just a good film. The ending is a little bit of a let down for how the whole alien invasion is resolved but it really couldn't be helped, in a movie about one military unit's involvement in a worldwide alien invasion. I can't really fault this movie other than it wasn't able to get me caring about the characters on anything but a surface level. Aside from that, it's well worth a look in, and I'd buy it for my DVD collection too.